The Netherlands became the first country to recognize the independence of the USA (even though this was unofficially) and John Adams, who later became the second president of the United States, was received by the States General in the Hague in 1782. Adams was recognized as Minister Plenipotentiary of the United States of America by the States General. On the same day John Adams bought a house in the Hague which became the first American Embassy in the world. 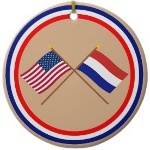 Diplomatic relations with the Netherlands are considered as the longest and strongest that the United States of America has. The countries are bound with tight economic relations and they cooperate in different international organizations. The Netherlands have five diplomatic missions in the USA: the Embassy in Washington, D.C. and four Consulates in Chicago, Miami, New York and San Francisco. The Embassy of the USA in the Netherlands is in the Hague and the Consulate is in Amsterdam.